Congratulations to those who earned the Doctor of Nursing Practice degree from Wagner College’s Evelyn L. Spiro School of Nursing at a commencement program on Dec. 13, 2017. The program began with welcome greetings from Patricia Tooker, dean of the Spiro School of Nursing, Richard Guarasci, president of Wagner College, and Lily McNair, college provost and senior vice president for academic affairs. Remarks were then offered by Kathleen Ahern, Spiro School graduate director, and Nancy Cherofsky, coordinator of the DNP program. 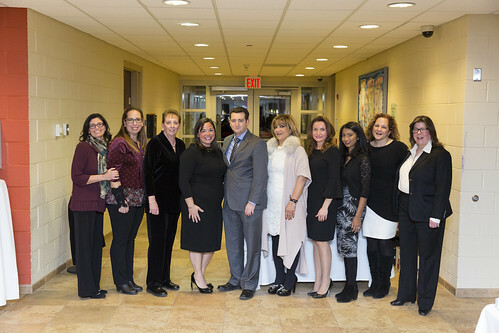 The December 2017 graduating cohort of the Doctor of Nursing Practice program at Wagner College's Evelyn L. Spiro School of Nursing posed for a group photo before their capstone presentations on Dec. 13. Select the "download" arrow, lower right corner, and pick "Original" for the highest resolution image.